Leona the leopard toe socks now available! Recently, Claire’s have had a few Winter Wear releases, including an Izabella the husky hat and mitten sets, hooded scarves modelled after Glamour the leopard, Tasha the leopard and Tabitha the cat, and Oscar the owl earmuffs. 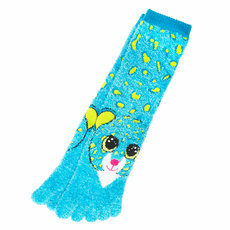 New to their cold weather range are brand new Leona the leopard toe socks! Currently, their website appears to be out of stock. However, they may be in stock at your local store.